My name is Bob Angel and my day job since the 1960’s was working with Honda motorcycle products. From 1982 to 2008 I worked for The Honda Motor Co as a development engineer dealing with product development and technical investigation on motorcycles and motor vehicles. In this role I worked directly with the Honda factories and the Research and Developments centres world wide, riding, testing, and developing some of the world’s most fantastic motorcycles, meeting and working with some of the most brilliant designers and engineers. In the mid 1980’s I was privileged to meet Mr Honda and work in a small team on a project in the UK that had Mr. Honda’s involvement. 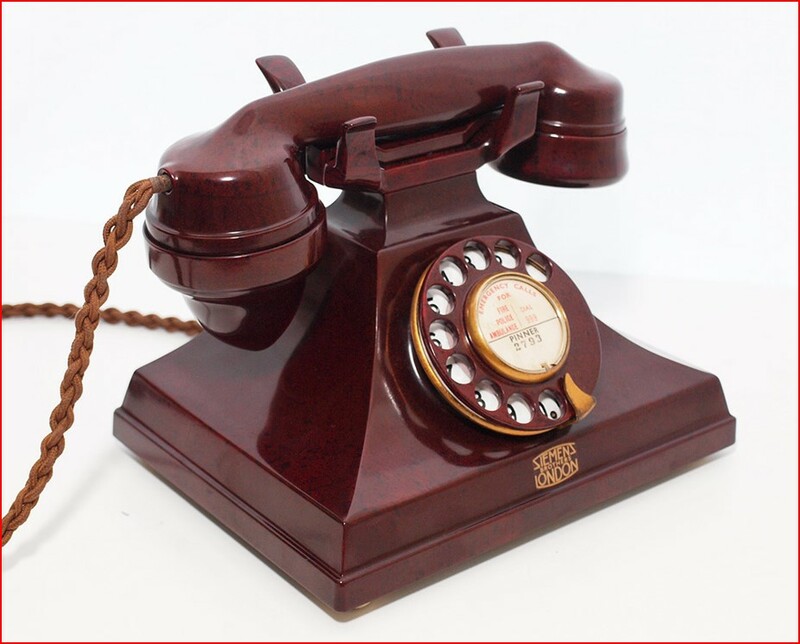 As a hobby I have been collecting and restoring vintage, veteran and antique telephones for around 26 years. 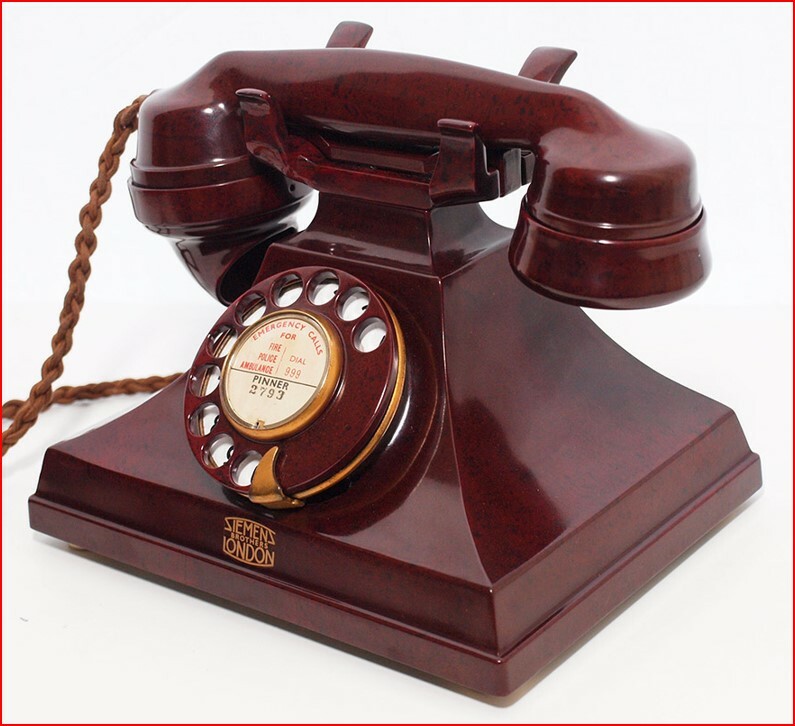 I cover all aspects of the telephone restoration process which include manufacturing items from scratch in various materials including brass, steel, wood and Bakelite. 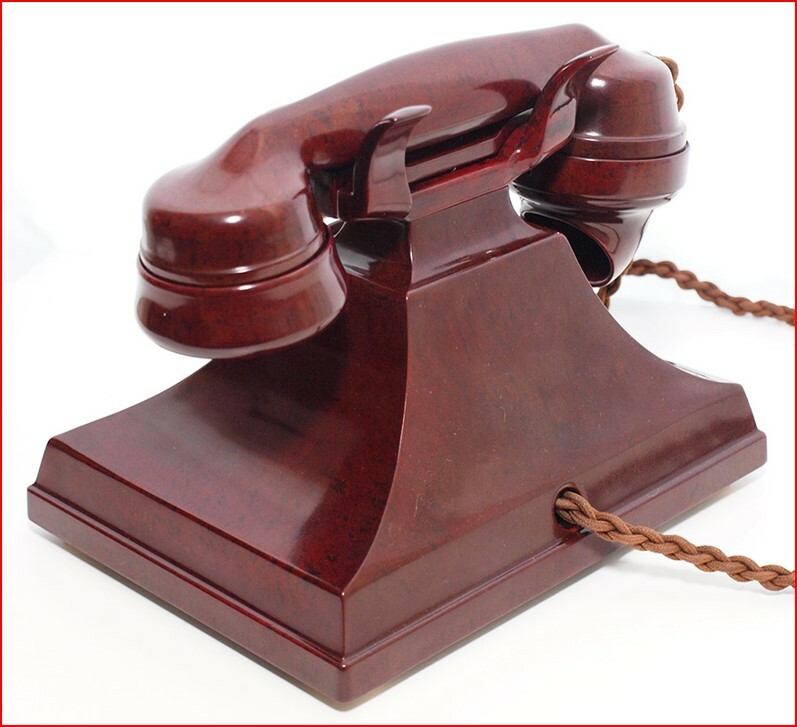 In the restoration process I also carry out the restoration and French polishing of wooden items and Bakelite repair. The skills required to cover the various aspects of restoration have been self taught and have drawn on this and my engineering experience to solve some problems in the field of restoration where there is “no manual”. 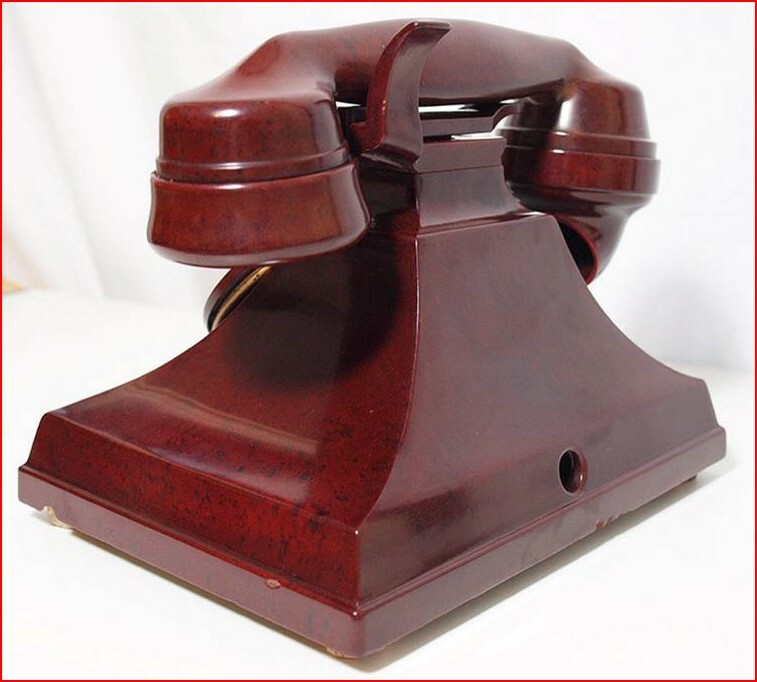 One such problem is Bakelite repair. 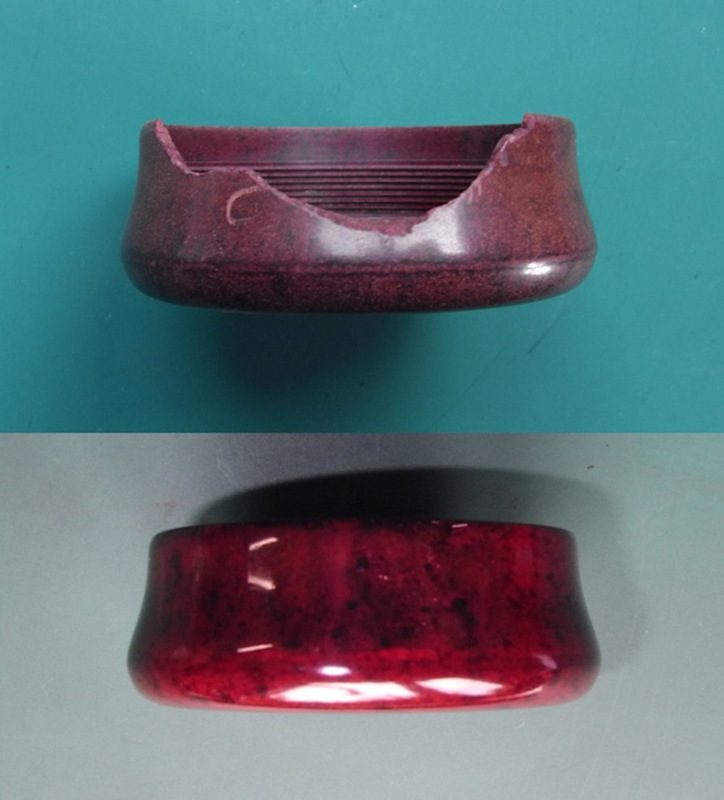 Damaged Bakelite may not be such a problem with Black coloured items as there are generally many spare parts around to replace these damaged items. In recent years a small number of very skilled people have spent a huge amount of time and money doing a fantastic job in recreating and remanufacturing some replacement parts in various colours and I complement them on their work. The main problem in the early days was that replacements for damaged parts in Red, Ivory, Green and Mottled Brown/Red were almost non-existent or when you found them, very expensive. 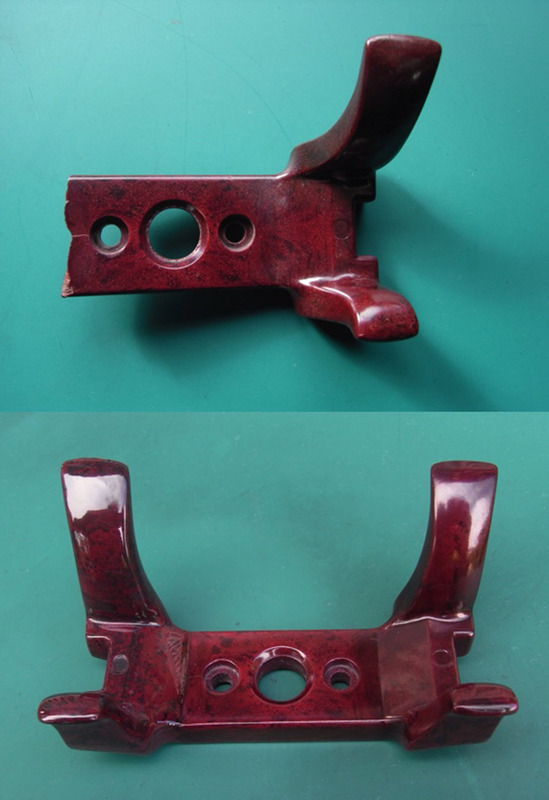 The main Bakelite restoration process available was to re-bond the broken parts, fill the missing areas with motor vehicle type body filler, refinish and then re-paint the whole part in colour matched paint. I have seen many repairs by other restorers using this process and have been very impressed with their results and can appreciate the skill required to carry out this type of repair. However, I wanted a process that did not include painting the repaired surface; I then started down a very long road to develop an alternative procedure. To cut a very long story short, a lot of work over the past 20 years has resulted in a developed process whereby a repair can be carried out to fractures, chips and the recreation of missing parts using pigmented resins. 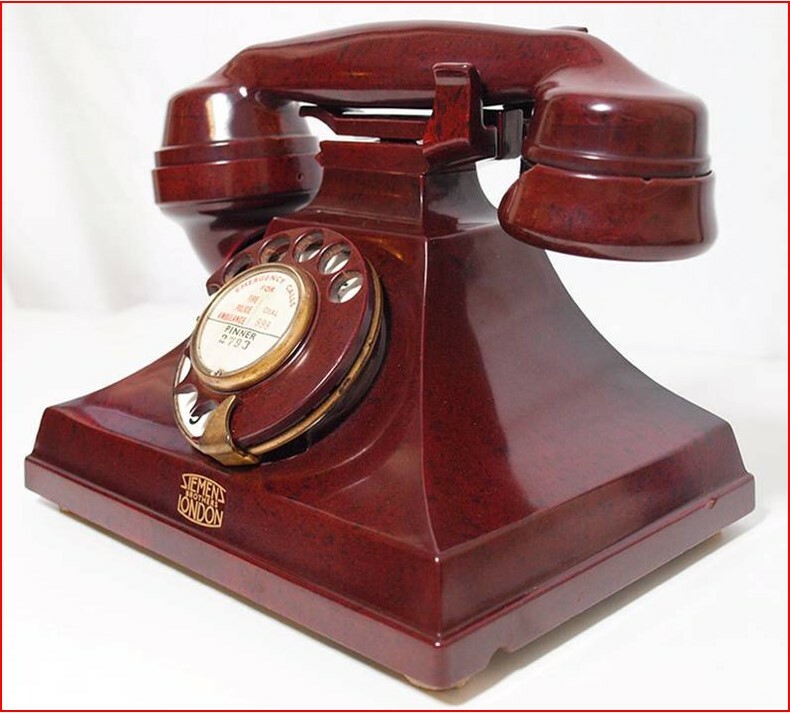 This type of repair allows the telephone to retain a level of originality that is dependant on the size of the damage and repair. Although every care is taken to produce the best possible results the repair will never be completely invisible and not all problems can be repaired using this procedure. Every repair is different, the colour variations of damaged parts are infinite and each fracture, chip or recreated missing part may require a different adhesive, resin or pigment. It really is a complete mine field of alternatives and variations and even after using the process for the past 20 years I am continually learning and refining the process. The time taken to carry out this type of repair process will be different on each repair, what I can say is that this type of restoration is generally very, very time consuming. 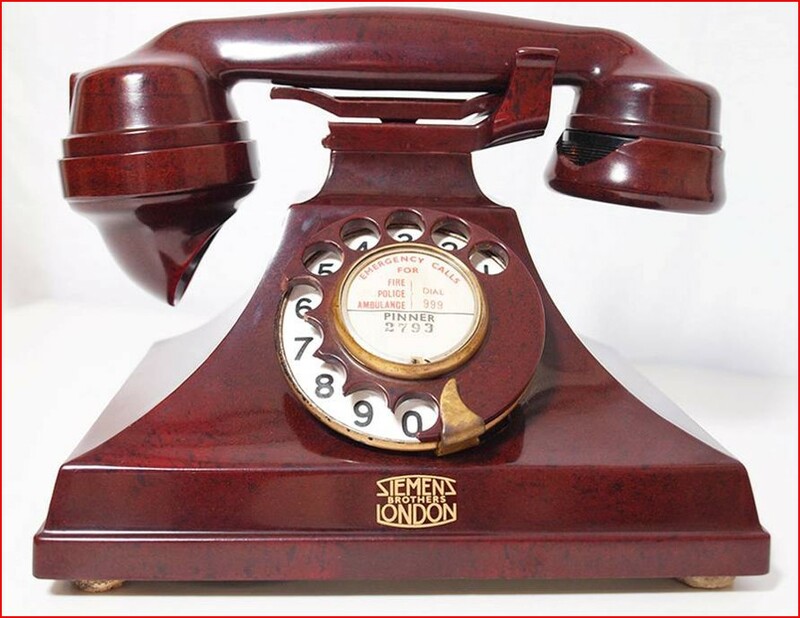 My friend Neil Carpenter contacted me and asked if I would look at a telephone he had in his collection, the telephone in question was a 1934 Siemens in a unique mottled burgundy colour, a very rare and although damaged, still a very expensive item. He was considering selling the phone and wanted me to inspect it and give an opinion as to whether or not I could carry out repairs on the significant damage the phone had suffered. 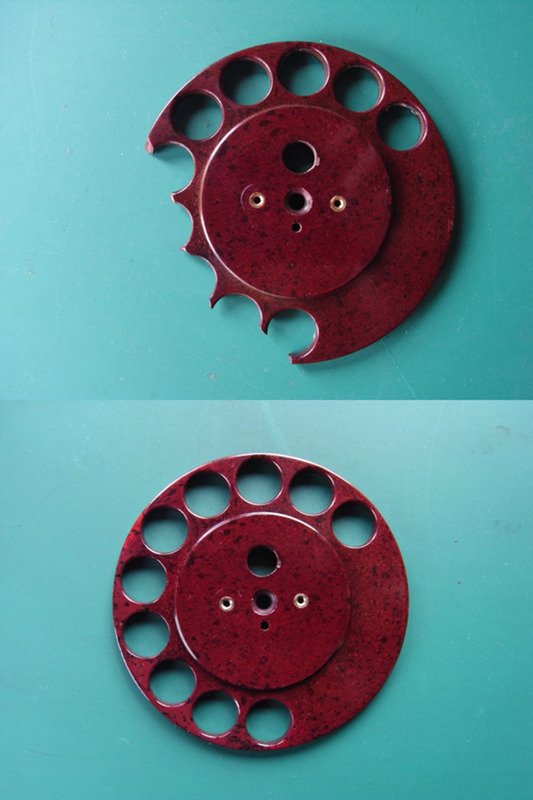 a) The dial finger plate had a large area missing from around the number holes 6,7,8,9,0.
b) The right hand base edge of the main body had an area missing and a number of chips. c) The left hand base edge of the main body had a large area missing and secondary fractures. d) The rear base edge of the main body had numerous chips to the lower edge. f) The plunger had the left hand section missing. earpiece missing and many secondary fractures and chipping to the edge. 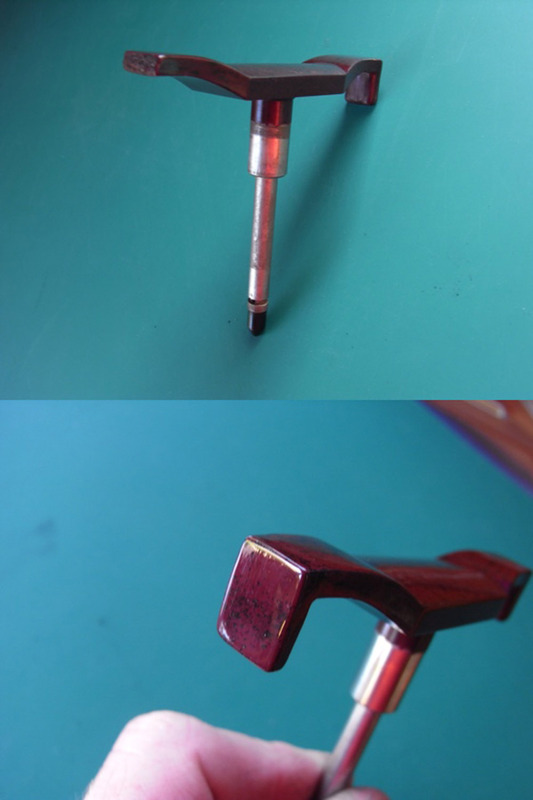 h) The Mouthpiece edge had a significant discolouration. Clearly the phone had suffered significant damage and even if it could be repaired the labour time to do this would be very high indeed. The decision was that a successful repair to the phone was a distinct possibility and based on that decision the phone was purchased from Neil by Andy Grant prior to any repair being carried out. After Andy had purchased the phone he visited me at my workshop with the damaged phone and we discussed in great detail the repair possibilities and his expectations from the work. It would take many hours to complete the work but it would be well worth spending the time to repair and recreate the missing areas and therefore improve the appearance and stabilise the future of a very rare item. That said however, there would be many problems to overcome in such a complex repair and these problems would be completely outside those experienced in the usual repair methods devised and used by me. As previously mentioned I don’t use paint to coat the surface of my repairs, the fractures, chips and missing areas are all repaired and recreated using pigmented resin. 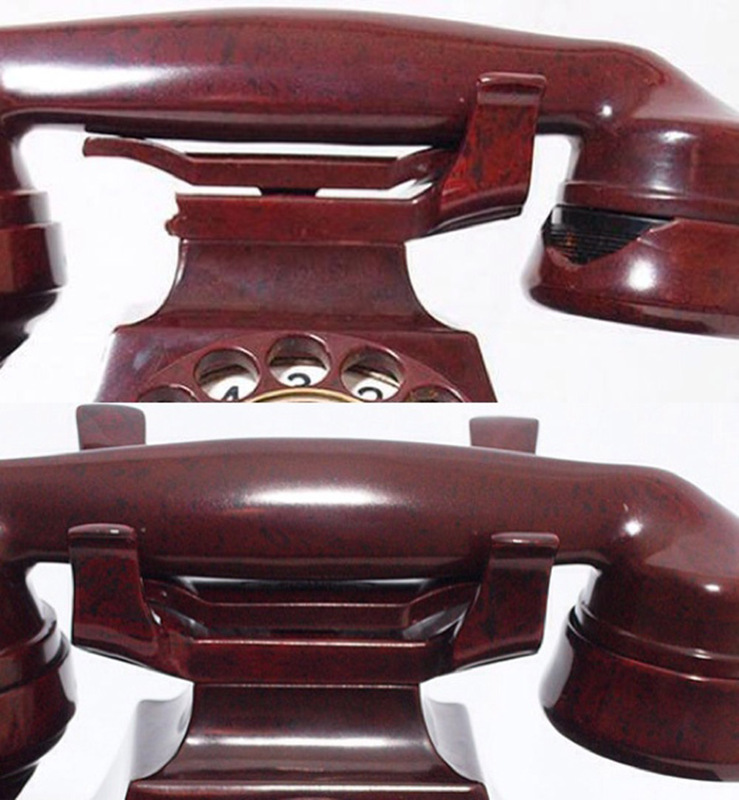 This type of repair recreates, as close as possible, the appearance of the material and colour used in the original production of the telephone. In this repair the first problem was going to be identifying and colour matching the base colour and additional colour variations including the mottle colour used in the phone. The correct colour pigments are not available “off the shelf” so they have to be recreated using primary colour pigments and it took around 8 hours to mix the required colour pigments. The second, and biggest problem, was inducing a number of different colours and the mottle colour into every sample of individual resin repair. This is very difficult and particularly on this phone as there is a large variation in the areas of repair, some are very small and some very large. 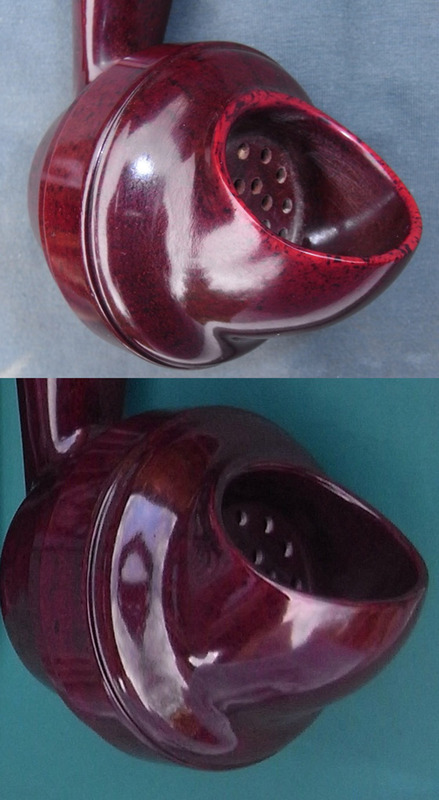 I have restored mottled colour telephones before using a process I have developed over many years but this particular phone has a very soft and subtle mottle in the base colour and my normal “mottle” repair method would not produce the required results. A new repair process was required and I spent around 50 hours over a 5 day period experimenting with many variations on ideas for a new repair process. After producing approximately 50 different test samples of the new process I felt the problem of having different colour pigments suspended, but more importantly separated in a single resin casting had been solved. All this work only established the process; I then carried out approximately 20 repair test samples using the new process, this was to establish that the repair was repeatable and I could increase and hone my skills in this method. This had to be carried out before I would attempt any repair on such a very rare and expensive telephone. 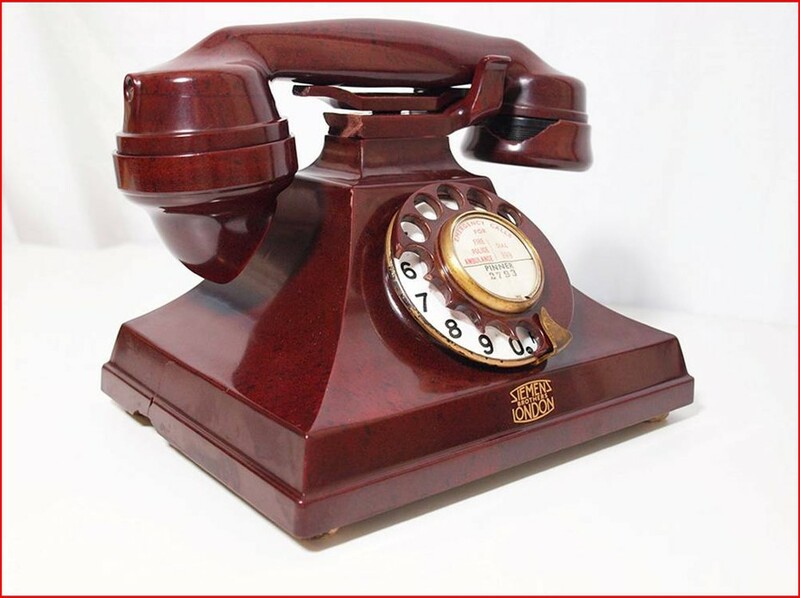 I will not make any comments regarding details of how the process works but I will say that it was extremely time consuming to complete each individual repair on the phone; it took approximately 200 hours to carry out all the required repairs to this telephone. Was it worth spending all that time on the phone? 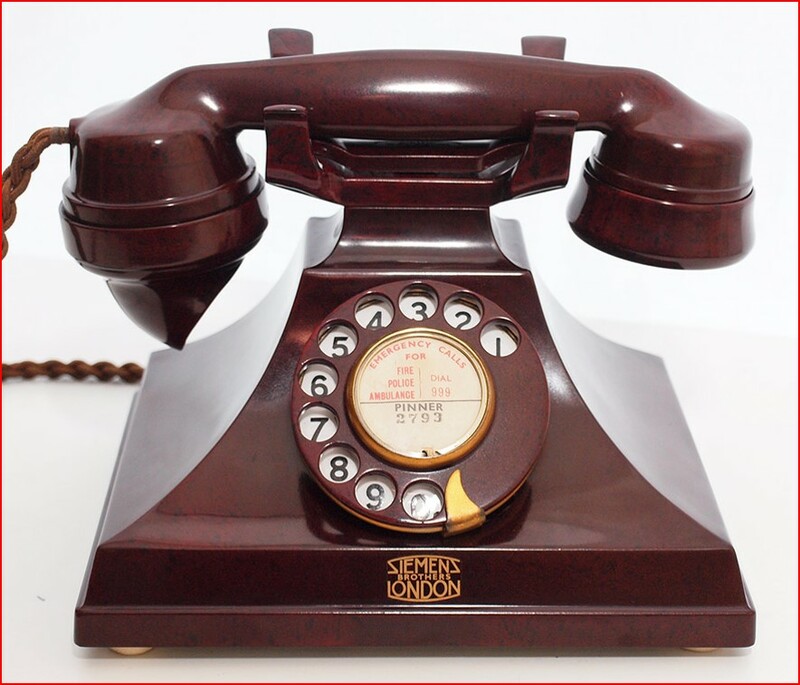 Yes, it was definitely worth the time and effort to develop the process’s to repair this telephone. Prior to repair the phone was a very rare, significantly damaged but still expensive item that unfortunately would always look incomplete due to the damage and missing areas. The final repair results have transformed the look of the phone. It was a huge amount of work but the phone is now repaired and protected for the future and the new owner now has a complete and very rare addition to his collection.